In West Slavic countries, as well as in Hungary, fermented cereals, such as rye or wheat, or sourdough, are used to make soups. In Poland, rye is traditional, making żur or żurek; a variant made with wheat flour instead of rye is known in Poland as barszcz biały ("white borscht"). Fermented wheat or sourdough soups are also found in other western Slavic nations such as the Slovak (kyslóvka), Silesian (Sauermehlsuppe) and Czech (kyselo – with mushrooms and without meat) cuisines. The sour rye soup (Polish: żur, żurek; Belarusian: жур, кісяліца;, zhur, kisyalitsa) is a soup made of soured rye flour (akin to sourdough) and meat (usually boiled pork sausage or pieces of smoked sausage, bacon or ham). It is specific to the cuisine of Poland, where it is known as żur or żurek (diminutive). In Poland it is sometimes served in an edible bowl made of bread or with boiled potatoes. The recipe varies from region to region. In Silesia, a type of sour rye soup known as żur śląski is served in a bowl, poured over mashed potatoes. In the Podlaskie region, it is common to eat żurek with halved hard-boiled eggs. In Poland żurek is traditionally eaten at Easter, but is also popular during other parts of the year. It is sometimes flavored with bits of sausage, usually eaten with bread or buns, or even served in a bowl made from bread. The Polish name 'żur' (diminutive: 'żurek') comes from the Middle High German word 'sūr' ('sauer' in modern German), meaning sour. Kyselo (or krkonošské kyselo) (German: Kübelsauer, Czech: kyselo) is a soup based on sourdough and mushrooms. It is a traditional Czech cuisine from poor folk food originating in the Northern Bohemia mountain region of Krkonoše. It is very substantial and it contains an abundance of quality proteins, B vitamins, dietary fiber and other important nutrients. Usage of sourdough is closely related to fermented flour usage in the Polish sour rye soup. Kyselo has been a traditional daily food of poor people in the Krkonoše mountain region for centuries, primarily in the winter. It is made from locally accessible, cheap, storable ingredients (the mushrooms are usually used dried) and nutritious ingredients so it provides substantial energy for hard mountain life and work. Historically kyselo was made without eggs. Eggs in early times were produced mainly for sale on the market, not for one's own family, so eggs were only eaten on some holidays. Potatoes became widespread among poor people of Czech lands in the late 18th century, so before that time soups of this type were also made without potatoes. Usage of sourdough indicates that kyselo has ancient origins, probably in medieval (and prehistoric) fermented cereal porridges. The Krkonoše region is on the Czech–Polish border, and kyselo is a close relative of the famous Polish sour rye soup. Other Slavic cuisines also have variations of soups based on soured flour or other modes of fermentation, such as Russian okroshka. Finnish hapanvelli soup is made by pea and sour dough. More distant relative of kyselo is for example Japanese miso soup, which also uses a fermented basic ingredient – miso paste. As a staple food, kyselo plays an important part in local legends and fairy tales, especially in connection to the mythical mountain lord Krakonoš (German: Rübezahl). It is said that he gave sourdough to people and invented kyselo. In Krkonoše there is also a mountain named Kotel (Polish: Kocioł, German: Kesselkoppe) which means cauldron. When fog rises from the valley at bottom of Kotel, people say that Krakonoš is cooking the kyselo. The name "kyselo" (but not the taste of soup itself, which is strictly regional) is well known in throughout the Czech Republic because of Večerníček children's television series Krkonošské pohádky (Fairy Tales from Krkonoše), in which Anče, one of the main characters, cooks kyselo in almost all of the episodes. The word "kyselo" is derived from in the word "kyselý", which in Czech language means "sour". The sourdough which kyselo is made from is called "chlebový kvásek" or "chlebový kvas" (not to be confused with the Russian "kvass"). Sometimes another sour mushroom-based Czech soup kulajda or its variants are mistakenly called "kyselo". The difference is that "kulajda" and similar soups do not use sourdough but sour cream or milk and vinegar. To reduce this misunderstanding, kyselo is often called "Krkonošské kyselo" ("Kyselo of Krkonoše"). In Eastern regions of the Czech Republic and in Slovakia there is a soup called kyselica (soup), but it is a variation of sauerkraut soup. 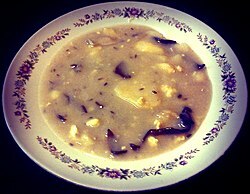 The basis of kyselo is strong broth made from mushrooms and caraway in water. It is thickened by sourdough which is poured into the broth. Then it is supplemented by onion sautéed in butter, boiled and then roasted potatoes and scrambled eggs and seasoned with salt and vinegar. Due to its ancient origins, kyselo has no fixed recipe and the preparation is a little different in every family. The recipe is passed on by oral tradition. There are local variants of kyselo in Krkonoše: without eggs or with hard-boiled eggs, boiled but not roasted potatoes, with or without cream, etcetera. Nowadays one can purchase an industry-made instant powder kyselo base for use in big canteens. Sourdough is the first basic ingredient of kyselo. It should ideally be made from rye flour. It can be bought at local food stores in Krkonoše. In the rest of the world it may be bought at some bakeries or it can be made from water, flour and allowed to attract wild yeast. Families in Krkonoše usually grew their own sourdough for years in special cookware called "kyselák" or "kvasák". Mushrooms are the second most important ingredient in kyselo. Central European edible species such as cep and similar species are used. The mushrooms are usually used dried in the winter. Kyselo is traditionally served hot in a soup plate or bowl. In some restaurants it is served in an edible bread bowl. Sometimes it is garnished with chopped scallion, parsley or other green herbs. The soup is eaten with a tablespoon. The potatoes are often served on a special plate (one for the whole table) and everyone can add any quantity as needed. Usually salt and vinegar are also on the table for personal seasoning preferences. Kyselo is a very nutritious food so it is often served as a main (and only) course, but in small quantities it could be also served as an entrée. Krkonoše, the region where kyselo originates. Krakonoš (German: Rübezahl), mythical inventor of kyselo. Kulajda, another Czech mushroom sour soup. ^ Aruna Thaker & Arlene Barton (2012). Multicultural Handbook of Food, Nutrition and Dietetics. John Wiley & Sons. p. 288. ISBN 9781118350461. Retrieved 14 March 2017. ^ Robert Strybel (2003). Polish Holiday Cookery. Hippocrene Books. p. 106. ISBN 9780781809948. Retrieved 14 March 2017. ^ a b c Petrák, František. "Svérázná krkonošská kuchyně" [Idiosyncratic Cuisine From Krkonoše] (in Czech). Retrieved 27 July 2012. ^ a b c d e Lokvenc, Theodor (1978). Toulky krkonošskou minulostí [Wandering the Krkonoše History] (in Czech). Czechia. ^ a b c d e Janků-Sandtnerová, Marie (1941). Kniha rozpočtů a kuchařských předpisů [The Book Of Cooking Budgets And Prescriptions] (in Czech). Praha: Česká grafická Unie a.s.
^ a b c Míček, Pavel. "Krkonošské kyselo a Žurek Poľski" [Krkonoše Kyselo and Polish Žurek] (in Czech). Retrieved 27 July 2012. ^ a b Břízová, Joza (1978). Pochutnejte si na polévce [Enjnoy The Soup]. Sešity domácího hospodaření (in Czech). Praha: Nakladatelství Práce. ^ Jebavý, Josef. "Pravé krkonošské kyselo" [The Right Krkonoše Kyselo] (in Czech). Retrieved 27 July 2012. ^ a b c Matějček, Jiří (1982). Rozhovory s mlčenlivými svědky [Dialogues With Silent Witnesses] (in Czech). Czechia: Severočeské nakl. ^ a b c Beranová, Magdalena (2005). Jídlo a pití v pravěku a ve středověku [Food And Drink In Prehistory And Middle Ages] (in Czech). Prague: Academia. ISBN 80-200-1340-7. ^ a b Lužná, Magda (2010). Vaříme pro děti podle makrobiotických zásad a nejen pro ně [Cooking For Children On Macrobiotic Principles] (in Czech). Olomouc: ANAG. ISBN 978-80-7263-602-0. ^ Kubátová, Marie (2011). Krkonošské pohádky [Krkonoše Fairytales] (in Czech). Praha: Fragment. ISBN 978-80-253-1126-4. ^ Pavlová, Svatava (2000). Dva tucty pohádek z Krkonoš a Podkrkonoší [Two Dozens Of Fairytales From Krkonoše and Podkrkonoší] (in Czech). Praha: Knižní klub. ISBN 80-242-0283-2. ^ Šimková, Božena (Writer) (1974–1984). Krkonošské pohádky [Krkonoše Fairytales] (Television production) (in Czech). Czechia: Czech Television. ^ Čermák, Jura. "Jednoduché kyselo" [Simple Kyselo]. Retrieved 27 July 2012. ^ Marhold, Jiří (1991). Krkonošská kuchařka [Krkonoše Cookbook] (in Czech). Hradec Králové: Kruh. ISBN 80-7031-708-6. ^ a b Čermák, Jura. "Krkonošské kyselo" [Krkonoše Kyselo]. Retrieved 27 July 2012. ^ "Vitana, a.s.: Krkonošské kyselo 2,3kg" [Vitana, a.s.: Krkonoše Kyselo 2,3 kg] (in Czech). Retrieved 27 July 2012. This page was last edited on 2 April 2019, at 11:42 (UTC).